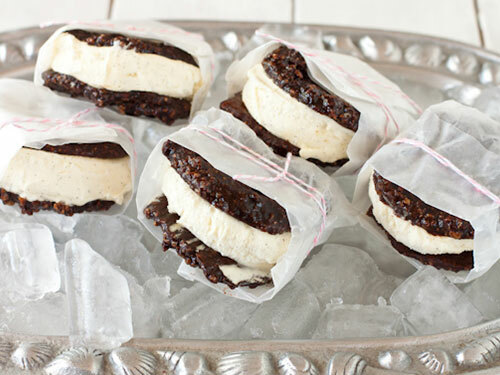 Ice cream sandwiches are the quintessential summer treat. They include a baked good (always a winner), they’re creamy, they’re sweet, and probably most importantly, they’re cold. But usually they’re full of refined sugar, grains, and dairy, so we all know traditional store-bought (and ice cream truck-bought, and boardwalk-bought) versions are not at all paleo-friendly. So try these paleo ice cream sandwich recipes including dairy free ice creams with fun flavors, and chewy, sturdy cookies, brownies, donuts, and other treats that are perfect for wrapping around a nice big dollop of ice cream. If you think dairy-free ice cream can’t be amazingly creamy, you have to try this sunflower butter banana ice cream with vanilla extract, maple syrup, and almond milk. Better yet, sandwich it between two of the chewiest, most delicious paleo chocolate chip cookies. Being the s’more enthusiast that I am, I’m pretty thrilled to be sharing this recipe for paleo s’mores in ice cream sandwich form. You’ll need ingredients like pecans, coconut flakes, coconut milk, cashews, arrowroot powder, honey, vanilla, cacao butter, and more. Maybe you call them Samoas and maybe you call them Caramel Delites, but either way, they’re that fabulous Girl Scout cookie that you can’t buy anymore now that you’re paleo. No worries, just make these Samoa donuts and sandwich them with dairy-free vanilla ice cream. I love the gorgeous color contrast between the golden snickerdoodle cookies and pure white vanilla or coconut coconut ice cream. These cookies are made with sunflower seeds, cinnamon, coconut sugar, almond meal, coconut flakes, coconut oil, vanilla, and psyllium. This smooth vanilla bean ice cream has a fabulous flavor, thanks to molasses and pure maple syrup. Gelatin adds extra nutrients while also helping the ice cream keep its structure a little better when sandwiches between healthy “peanut butter” cookies (don’t worry, they’re peanut-free!). 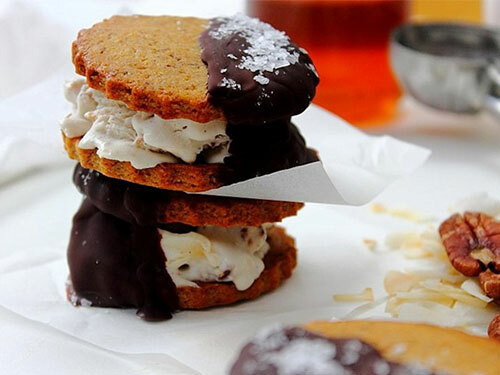 Who says you need cookies to make ice cream sandwiches? This version is made with banana bread and a vanilla-cinnamon ice cream made with full-fat coconut milk and sweetened with honey. I love those flavors with banana bread! Nope, that’s not typo in the title—there’s no oatmeal in these oatmeal cookies, which are deliciously flavored with the perfect texture. Both the cookies and the banana-coconut ice cream have bananas, along with almond butter, cinnamon, and other delicious flavors. With paleo chocolate chip cookies and chocolate ice cream, these cute little ice cream sandwiches offer double the chocolate with none of the grains or refined sugars. The chocolate ice cream is made with coconut milk and avocado for lots of healthy fats! I love these simple chocolate chips cookies made with coconut oil and mini chocolate chips, and filled with a honey-sweet banana nice cream. 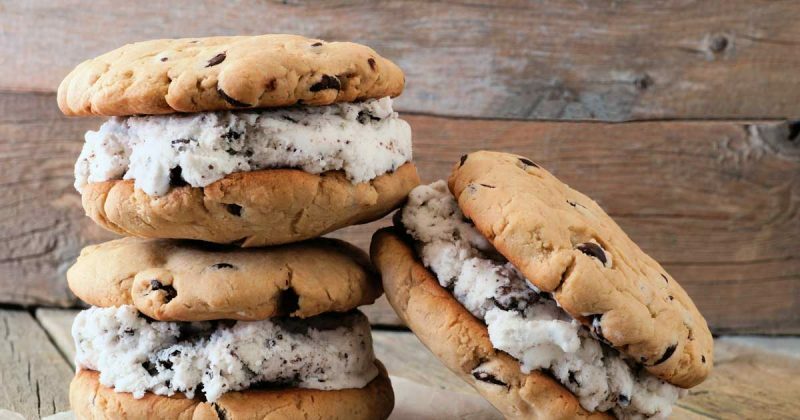 You don’t need to make everything fancy to whip up quick ice cream sandwiches. These come together no-problem! To make this creamy treat, you’ll need almond butter, eggs, coconut sugar, honey or maple syrup, ground flaxseed, vanilla, sea salt, and mini dairy-free chocolate chips. Enjoy Life brand is a great source for the chocolate chips. I love them with the banana ice cream! These chewy chocolate almond cookies are made with black almond flour, arrowroot powder, cocoa powder, coconut oil, maple syrup, and vanilla. This blogger recommends pumpkin ice cream, but any flavor will work if you can’t find it dairy-free! Made with simple, coconut-sugar sweetened chocolate cookies and an easy coconut whipped cream “ice cream” flavored with vanilla, these may be the easiest homemade ice cream sandwiches you’ll ever make. And the ice cream is sweetened with stevia! The only way to make an ice cream sandwich better is to use cookie dough instead of cookies, right? Right. Try these amazing cookie dough ice cream sandwiches made with cashew butter cookie dough with browned butter, cinnamon, and vanilla, with a middle layer of creamy coconut milk ice cream. Ice cream sandwiches are a summer treat, and sometimes in summer, it’s just too hot for the oven. 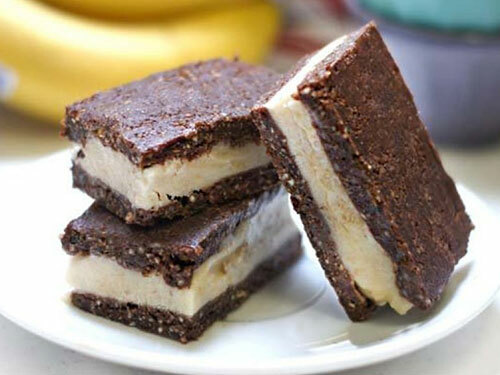 So make these raw cookie and ice cream sandwiches with raw chocolate cookies and banana-vanilla dairy free ice cream. You’ll never look back. I replaced the peanut butter in this recipe with almond butter to make it paleo, but you could just as easily use cashew butter, hazelnut butter, or sunflower seed butter to make these delicious strawberry ice cream sandwiches made with just frozen strawberries and coconut cream. With the makings of a perfect whoopie pie, these soft and chewy cookie cakes are made with coconut sugar, flax meal, cocoa powder, coconut flour, arrowroot flour, and a few other delicious ingredients. And this is a chocolate whoopie pie, friends, so don’t forget the chocolate ice cream. I’m a huge fan of chocolate and fruit combinations, so I really love these double chocolate chip cookies with double berry ice cream, made from frozen blueberries, strawberries, maple syrup, coconut cream, and vanilla extract. These flourless chocolate chip cookies are made flourless with sunflower seeds, cocoa powder, vanilla, and honey (to replace the agave syrup). Use honey as well in the vanilla bean ice cream with real vanilla beans, egg yolks, and a coconut milk base. Chocolate chunk cookies with chocolate banana ice cream? Yes, please! Make this recipe with almond and coconut flours, coconut oil, vanilla, sea salt, honey, maple syrup, chocolate chunks, bananas, coconut or almond milk, and cacao powder. This version of paleo ice cream sandwiches is reminiscent of your favorite childhood treat, with the best ever paleo vanilla ice cream, paleo graham crackers for the cookies, and a chocolate magic shell coating. Your kids will thank you when you make them these! 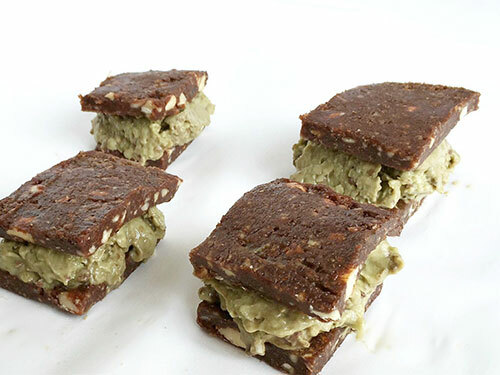 Made without almond flour, nut milks, nut butters, and other common paleo allergens, these ice cream sandwiches have a vegan vanilla ice cream sweetened with maple syrup and a raw vegan cookie dough made with coconut butter and dates. 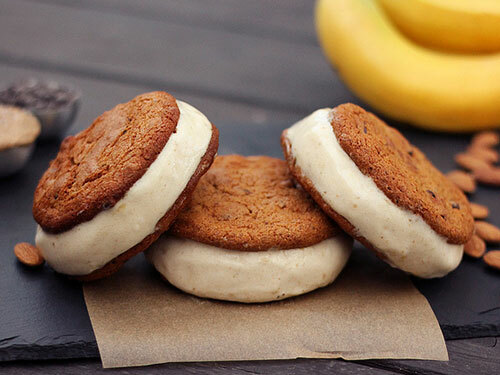 These ice cream sandwiches are the closest you can come to a whole food version of these treats, because the sandwiches are just sliced bananas filled with almond butter. 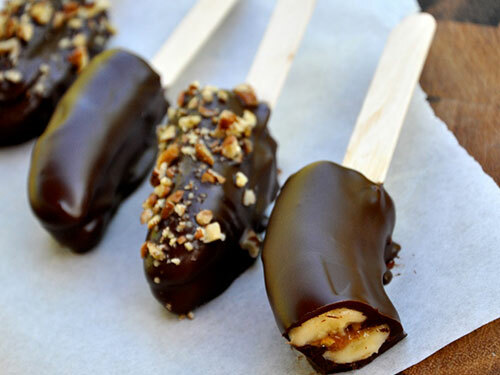 Dip them in chocolate and sprinkle with crushed nuts for a delicious, healthy treat. Why just make the cookies chocolate chip when you can fill the whole sandwich with those perfect little guys? 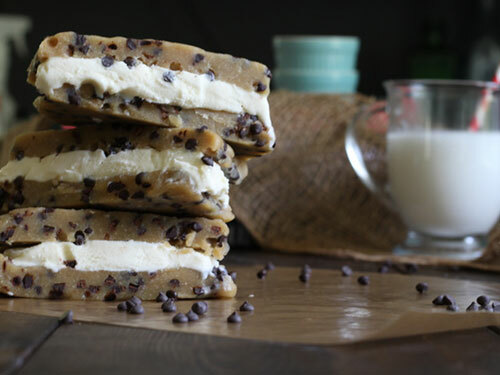 This version of paleo ice cream sandwiches involve honey-sweetened vanilla coconut chocolate chip ice cream with sunflower seed butter and maple cookie dough layers. Shortbread cookies not just for tea, my friends. Make these almond flour honey-vanilla-walnut cookies and fill them with raw cashew-coconut ice cream, with melted ghee, maple syrup, vanilla extract, and sea salt creating a delicious caramel flavor. These are made with not cookies…not cookie dough…but brownies! I love the flavor combo of fudgy, raspberry deliciousness with cashew-based raspberry ice cream with melted cacao butter for a white chocolate kind of flavor, with vanilla beans and maple syrup. I can’t get over the thick, chewy cookie dough in this recipe, filled with delicious little mini chocolate chips. This version is sweetened with maple syrup and flavored with vanilla and pastured butter, with homemade vanilla ice cream in between the layers. These fudgy chocolate chip cookies are double chocolate, and so soft and chewy they’re almost like brownies! Put layers of them around this creamy salted vanilla coconut milk ice cream, which is a custard based ice cream so strong with vanilla you can hardly taste the coconut. Made with chocolate cookies filled with butter or ghee, chocolate chips, and vanilla, you won’t believe these ice cream sandwiches are a low carb! Fill them with a batch of homemade, dairy-free, paleo-friendly vanilla ice cream and say hello to paleo paradise. Dates and cashews, in paleo dishes, create a magical flavor combination that ends up being something like creamy caramel. Delicious. So those ingredients are perfect in these paleo ice cream sandwiches, made with flourless (shredded coconut) cookies and coconut milk ice cream. 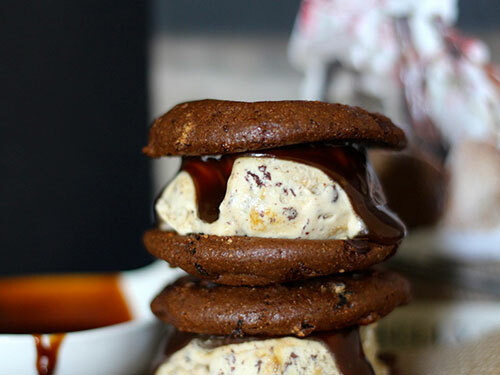 These soft of chewy double chocolate cookies are served all drizzly with coconut caramel sauce and a sandwiches of homemade salted caramel ice cream, complete with coconut milk, dates, almond milk, vanilla extract, almond extract, and chocolate. The shape and style of these ice cream sandwiches reminds me of those simple vanilla ones you could get from the ice cream truck as a kid, or out of the cooler next to the check out counter at the grocery store. You know what I’m talking about. Except these are paleo, and strawberry! This recipe makes a big sheet of ice cream and cookie goodness, which you can then cut into squares or bars of whatever size you desire. And the ingredients are really simple and easy, with just nut butter, honey, egg, vanilla, cocoa powder, and bananas. Thanks to luscious and silky paleo-friendly coffee ice cream, these treats have a grown-up flair that will have you longing for one right around 3pm when you’re slumped over your desk at work and your boss is sending you email after email. Mint chocolate chip ice cream is my very favorite flavor, and I love to see it made healthy-style into paleo ice cream sandwiches. This recipe uses bananas, coconut milk, avocados, mint extract, dates, chocolate chips, almonds, cocoa powder, and coconut oil. Looking for an ice cream sandwich that’s perfect for fall? 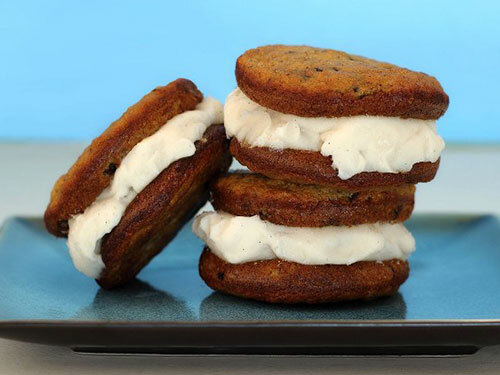 Look no further than ginger pumpkin ice cream sandwiches, with creamy homemade pumpkin ice cream sandwiches between two ginger cookies made with pecans, dates, cinnamon, fresh ginger.